Welcome to Kathryn Wyatt's online web home where you'll find details on Kathryn's Regency romances and information about the author and her current literary projects. 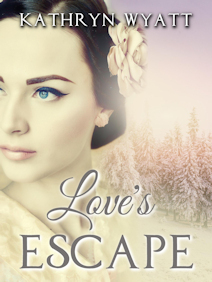 Her most recently available novel is called Love's Escape and is available in e-book form from a variety of online electronic book retailers including online publishing site Smashwords. Read more about this English Regency story below. Hoping to book passage on a ship to America so that she might escape a dangerous arranged marriage forced on her by her uncle, Elizabeth Ainsworth flees her home on a desperate journey northward that nearly results in her death. Weakened and feverish, she is rescued by chance passerby Dante Moberly moments before she would die from exposure to the bitterly cold night. The meeting changes both their paths and throws emotional twists into two already complicated lives. Dante is as reserved as Elizabeth is intelligent, but despite their differences they are strongly drawn to one another and find their futures intertwined as they try to save Elizabeth's life. Traveling during the icy English winter, they work to stay ahead of her uncle's relentless pursuit and must eventually prove her uncle's guilt in the deaths of Elizabeth's parents and his plan to take control of the Ainsworth family fortune. Their harrowing adventure together cements a deep bond between them, their differences becoming futile in the face of such a strong emotional union. Click here to read a preview of the first chapter of Love's Escape.